Professional Painters have more leverage when buying paint because they do so often and in larger quantities than a DIY homeowner. Most paint stores understand this and offer professionals a “pro deal” of some sort which gets passed down to the customer. The prep work before painting begins is often some of the hardest work there is. This process is just standard procedure for painters. They know how to begin a job properly so furniture, appliances floors and other objects in or outside your home do not get damaged. Knowing how to tape off properly means cleaner lines, too! As far as injuries go, if your paint job requires a ladder or scaffolding of any kind, the likelihood of injury increases significantly. Most ladder injuries happen between 2’ and 6’, so it does not even have to be a huge ladder! In addition to ladder injuries, if you have ever painted a ceiling before, you know neck pain is real! Painters do this work full time, so they practice techniques and procedures that prevent injury. A DIY painter has a higher probability of missing work, needing medical help, etc. I should start off with the disclaimer that not all painters prefer to paint with the best. Most do though because they know you will be happier in the end and more likely to refer them. Some paints require more coats, extra primer, etc. Just choosing a better paint could save you money in terms of supplies. Yeah, that can of paint from Home Depot only cost $18, but you will probably need 4 coats just to get it to look right and God knows how long it will last! Most painters have tried all the paints and know what lasts longer, covers well and looks best in specific settings. Sure a paint store could give you some pointers, but a painter will see and know your house and be able to give you more tailored advice. Just painting a basic living room could add up in terms of special drop cloths, brushes, and rollers. If you needed a professional sprayer or scaffolding for instance, your job just jumped up into the thousands. Professional Painters often own this equipment already and will use every tool in their arsenal to make to job stand out. I know I’m beginning to repeat myself, but knowing how to tape off a living room, what brush to use on a ceiling, how thick to lay the paint, what sheen to use, what color complements existing colors, how many coats and what kind of primer to use can make all the difference in a room you love for years or one you want to repaint immediately. It is estimated that one in five DIY painters end up hiring a professional painter anyway. Most of us already work a full-time job and only have a few hours in the evening and weekends to unwind. Do you really want to spend them painting? A team of painters with years of experience will take a job that would normally take you months to accomplish in your spare time and finish it in a few days. 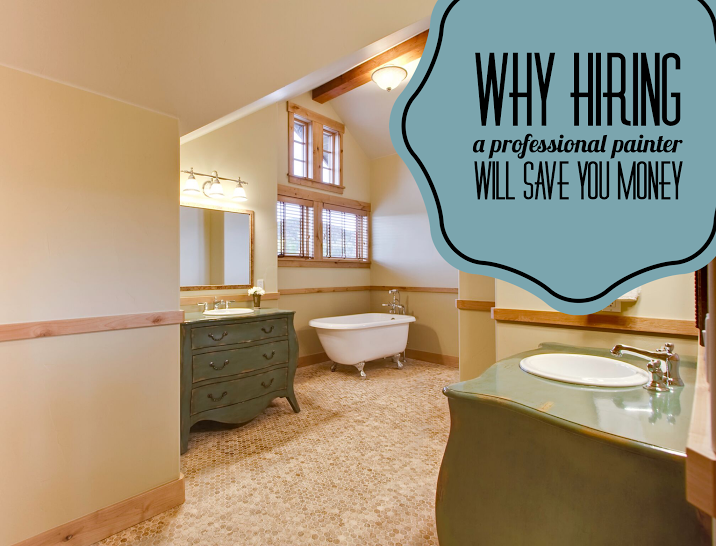 These are just reasons hiring a pro could save you money. This does not cover why hiring a professional could also save you lots of stress, frustration and precious time with family! If you live in Durango area and would like a free estimate, please don’t hesitate to give us a call anytime at (970) 903-4305. We promise to do a professional job every time!